Sau-Wing is born and raised in a Christian family in Hong Kong. He accepted Christ at age 12, met his wife Edith at age 16, and came to the U.S. as a foreign student at age 17. He graduated with an MBA degree from U.C. Berkeley. Thereafter he held senior executive positions in banking, finance and telecommunications. His last position was the Chief Executive Officer and Chairman of the Board of the United Commercial Bank, then the largest bank in the Chinese community in the U.S.. When he turned 45, with God’s grace, he retired from the commercial world so he can devote all his time in a financial stewardship ministry. For the past 20 years he has been using financial management as a tool to reach the unsaved with the gospel. To avoid any kind of conflict of interest, and by God’s grace, he remains an unpaid volunteer throughout these 20 years of ministry. Sau-Wing preaches and speaks frequently at Chinese churches. Each week he hosts five live financial radio programs in San Francisco, Los Angeles and New York when he answers call-in questions from listeners. 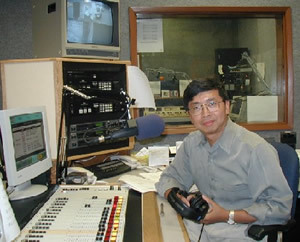 Each Friday evening he hosts a live television program on KTSF. He also invites his listeners to ask questions by e-mails and he receives an average of 100 e-mails each single day from people in different parts of the U.S. He visits families with special needs to help them solve their problems. Sau-Wing recently finished his 7-year tenure as Ministry Director of the Northern California branch of Chinese Christian Herald Crusades and the Chief Editor of the Northwestern edition of Herald Monthly, both unpaid positions. He has a passion for Israel and has led 16 tours to Jordan and Israel. He speaks frequently about the history and future of Israel.